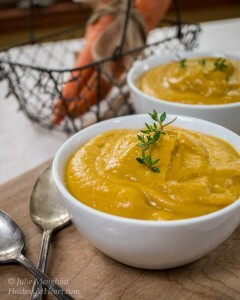 This Healthy Cream of Roasted Vegetable Soup recipe can be made for one or a dozen people. This soup doesn’t use dairy products so is perfect for lactose sensitive or people living a vegan lifestyle. 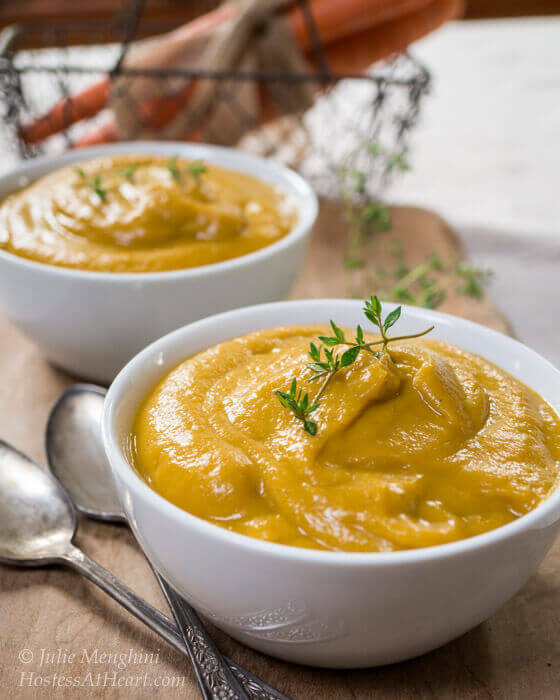 I have a horrible habit of overbuying vegetables Thank goodness for this quick and delicious Heart Healthy Cream of Roasted Vegetable Soup recipe. It’s a great delicious way to use them without a lot of fat or calories! I love going to the farmers market or wander through our grocers produce department. Unfortunately, I can’t resist buying more produce than we can eat. Does anyone else tell their vegetables how beautiful they are? I can’t be the only one? John does a pretty good job eating his veggies but the list that he tolerates is shorter than his off-limit list. I, on the other hand, crave vegetables of all kinds. I love them raw or cooked in about any manner, especially roasted or grilled. When I get around those beautiful vegetables, I just can help myself. Invariably I buy more than I can use. 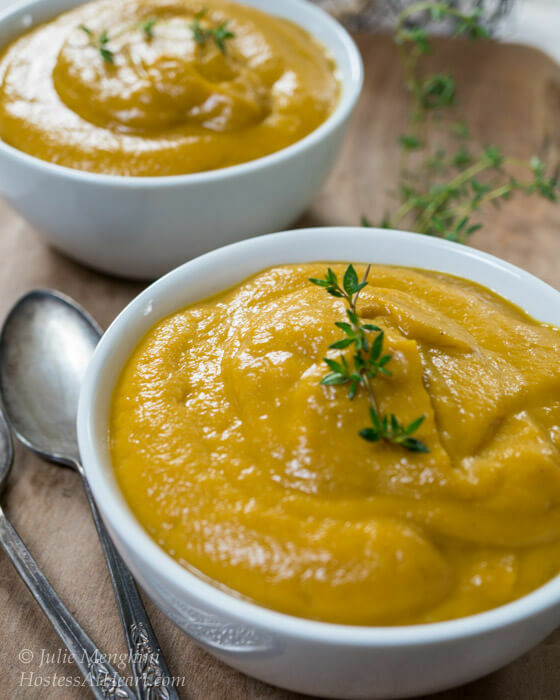 Recipes like this Healthy Cream of Roasted Vegetable Soup is perfect for me to make in a moments notice. There’s nothing better than those soups loaded in cream or butter. This soup only tastes like it is. 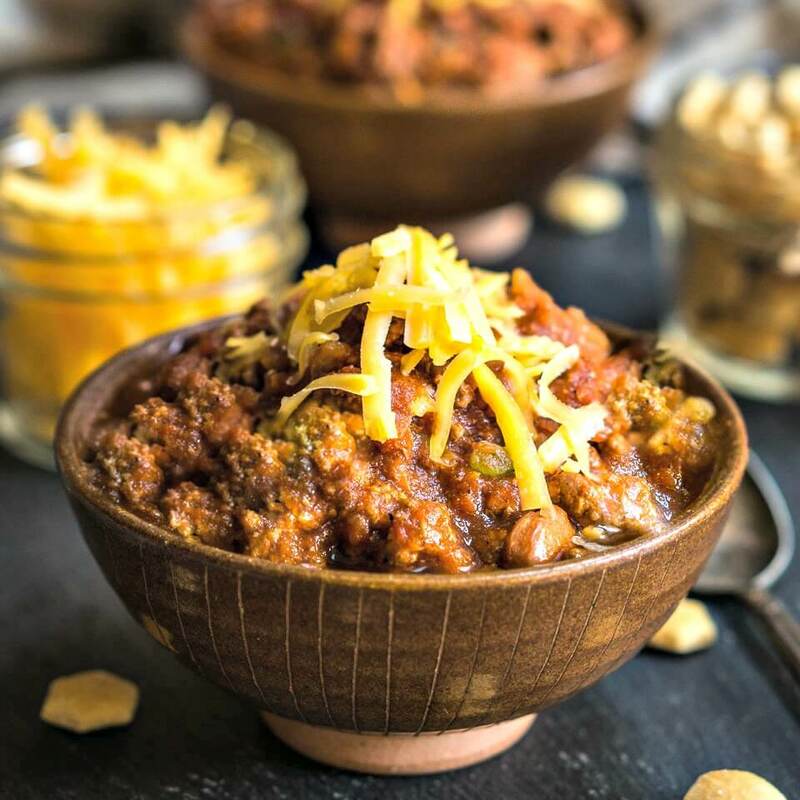 It’s not only delicious but the perfect option to make when you’re watching your waistline or not sure if your guests follow a specific way of eating. This recipe is on everyone’s list! A creamy vegetable soup is not only easy but delicious and healthy too. This soup can also be used as a base for many other recipes. Prepare vegetables by washing, peeling, and cutting into large 2-inch chunks. Place vegetables in a single, non-crowded layer onto a rimmed sheet pan. If too crowded, vegetables will steam and not roast. Use two pans if roasting a large amount. Drizzle olive oil lightly over vegetables, and salt and pepper. Mix in fresh or dried herbs. Bake vegetables for 20 minutes or until lightly browned. Remove herb sprigs and place in a dutch oven or large saucepan. Add broth or stock to just cover the vegetables. Simmer until vegetables are soft. 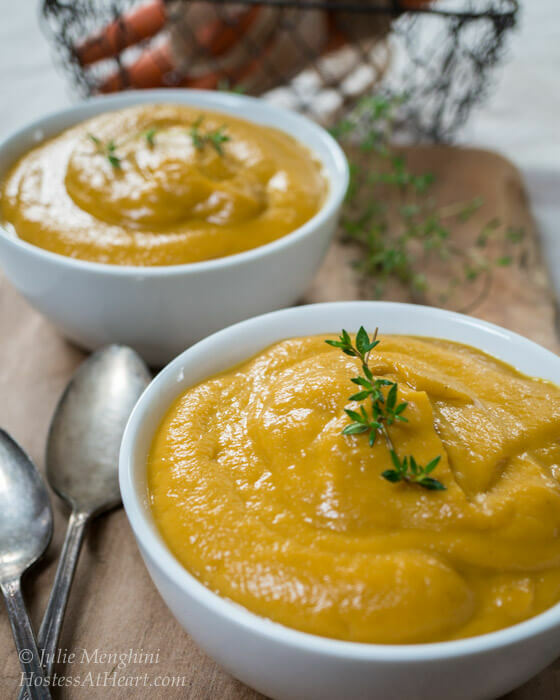 Puree vegetables together using a blender, food processor or immersion blender. Garnish with herbs, and serve with fresh crackers if desired. Another great way to use this creamy dreamy soup is as a base for other dishes. Add protein or grains and you have another meal ready to go. I’m a soup lover and having a variety such as this one keeps me happy all year long. When the fall vegetables are long gone I can even use frozen and still enjoy this delicious soup. 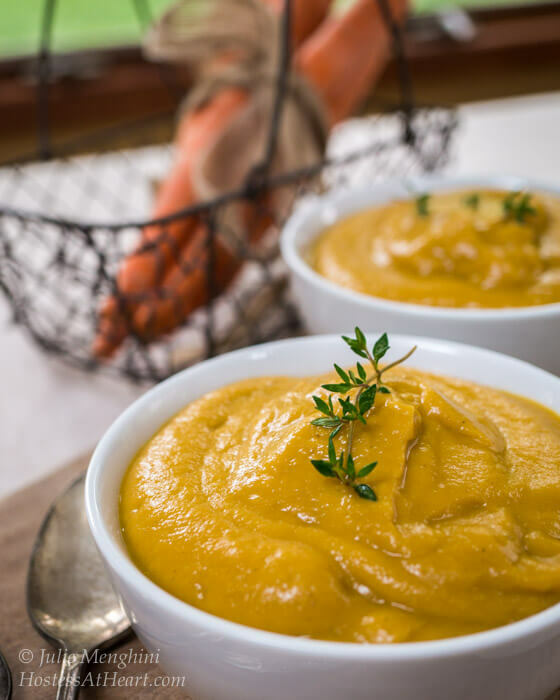 Here are a couple of other soup recipes that we love to make! Oh wow, does this look good! 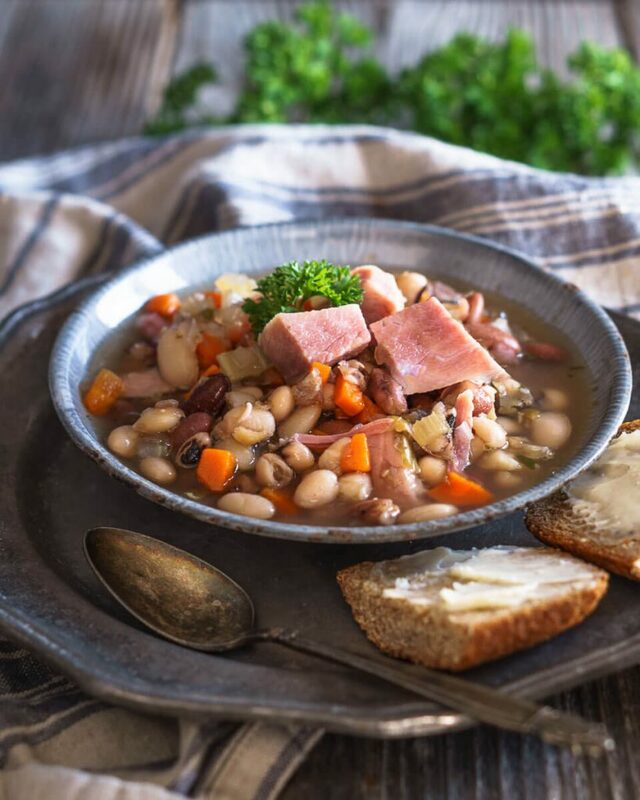 This would be the perfect dish to warm you up on a cold, winter day! I adore roasting vegetables and the next step of turning them into a “creamy” soup is just so smart. Thanks for a great recipe and method. Thank you! We love easy meals like this especially when they are diet friendly. I can eat creamy soups every day! 😀 They are also so easy to prepare – it’s great for busy days. That is indeed a beautiful soup! I loved the baguette in the photo too, and envisioned a delicious meal. Thank you for stopping by and bringing me that beautiful recipe. Wow! What a gorgeous and healthy soup! I was so surprised when you said there was no cream in it. What a happy accident. Your pictures are really stunning, Julie! Thank you Shari! It was a delicious whoops! This is a perfect autumn soup! Healthy and delicious. Thank you Amy! Have a wonderful day! 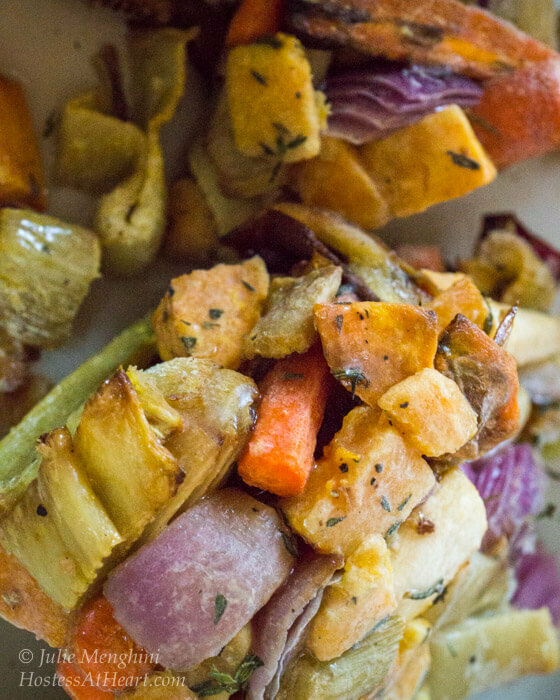 What a delicious way to use roast vegetables. This looks like the perfect autumnal soup. Thank you Angela! It is perfect for fall, and makes a great base for other great soups too. Thank you Natalie! Potatoes or squash will do this so I’ve learned :). Thank you so much! It is warming and delicious! I know Linda, me too! Never to late to learn right? 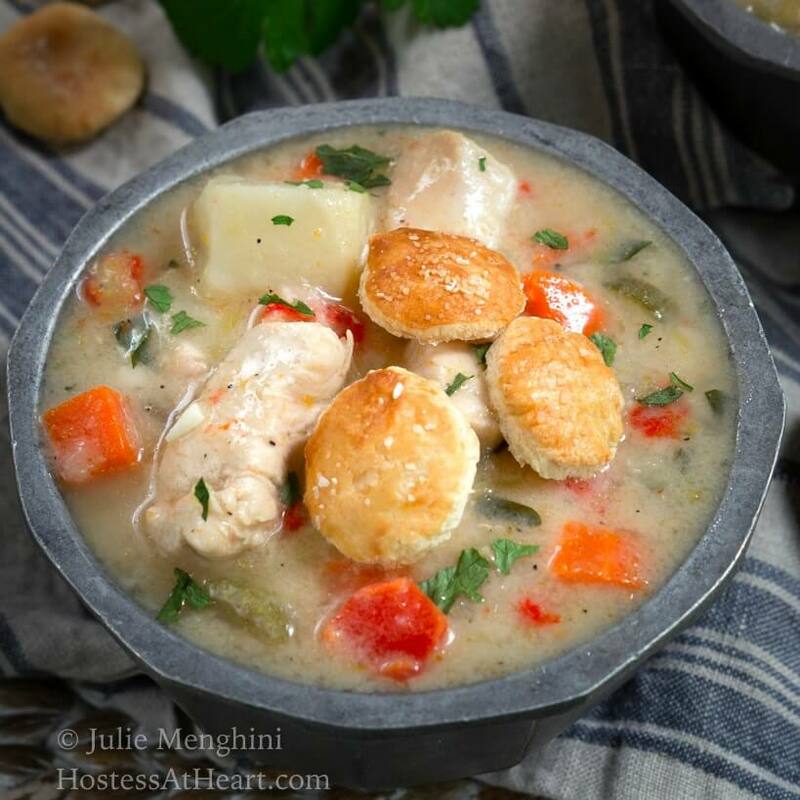 Julie, this soup looks absolutely divine and your photos are gorgeous! You have grown so much! 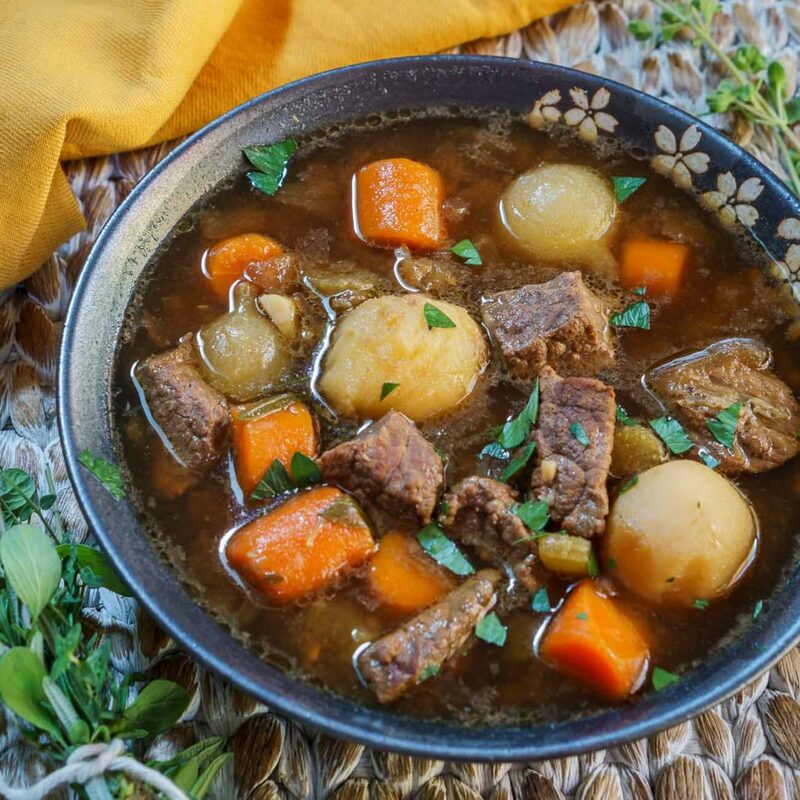 Love this recipe, and I’m glad you’re having a mild and pleasant autumn! Thank you Tracey! What are you doing home? You should be out tearing up the town! I’m really enjoying learning about the photography. So much to learn. I am not a big fan of frozen veggies (something about the texture) but the way you have fixed them is brilliant! Once they are roasted and blended into a soup who cares about the texture. Thanks Julie! Thank you Judi! I think it helped that they really hadn’t been in the freezer all that long too. This soup sounds right up my ally! And of course, I applaud your frugal “save” of the veg – what a great soup and a fun way to solve a dilemna so many of us have in the fall! My herbs knew it was fall, too, in spite of the nice weather! Thank you! I need to quit buying like I am cooking for an army. I do use my freezer a lot though. I love how thick and creamy this soup is, Julie–and even better, since it doesn’t have the cream! Looks like a wonderful soup! Thank you Nancy! It was delicious, and I’ll use it for other soup with what I managed to get back into the freezer. I think that being able to roll with the challenges is what makes a cook be their best! oh wow you caught me there, just love roasted veggies in any form and this sounds great…apt for the weather… am craving for it right now…. Lovely texture and nice idea Julie. I think this cream can form a base for many interesting dishes. I am getting ideas already. It can work well as a dip or sauce too. I think you are right skd! Thank you! You are right skd! You always have the best ideas! First I love roasted veggies. Second the soup looks awesome especially with not using cream Third you need to invest in a immersion blender. One of the best tools I have in my kitchen. I actually won mine at a golf outing about 15 years ago. No one else but me would pick that as a raffle gift at a golf outing but me. I have an immersion blender :). I have some very nice Le Creuset dutch ovens though and don’t want to scratch the enamel. Thanks for stopping by Quinn! Makes since. Have a great weekend. Thanks Jhuls! Thank you for hosting! I love your method of freezing the veggies yumm! This soup sounds very wonderful! I think I need to try it! The pictures are also lovely and this soup looks beautiful!! Thank you dear Lynz! I love soup, and it was a great way to have the fresh veggies on hand. I have also froze whole onions. Once they thaw a bit you can cut them and you don’t cry! this is such a great tip inside of a recipe! I never knew how freezing would come out but sounds great and convenient! Thanks Lynz! I hope it’s helpful for you. This is just perfect for this weather, Julie! I agree! Thank you Ginger! What a wonderful idea. Thank you for explaining the steps in avoiding wastage of food. Very inspiring! Thank you Apsara! So happy that you stopped by! This sounds wonderful, Julie! Creamy and delicious! Thank you Ana! Yummy and versatile. This looks so yummy. I am looking forward to seeing the recipe! Thank you! I will write it up and stick it on here! I took you advice and added a recipe to this post. Thank you for visiting! This soup looks incredibly creamy and thick- delicious!! The color is gorgeous too. Wow what a gorgeous creamy soup and with no cream. I can just imagine the flavor with those delicious roasted vegetables. Perfect fall meal Julie!! Thank you Suzanne! Have a wonderful day! Mmmmmm good and so pretty! I eat vegetarian food at lunch time. This would be perfect for my lunch. Thanks for sharing. Thank you Liz! Not much of a recipe, but it sure is delicious. Enjoy your day and thank you for stopping! Thank you Loretta! I will definitely make this accident again! I had carots but will remember the tip for the potatoes.